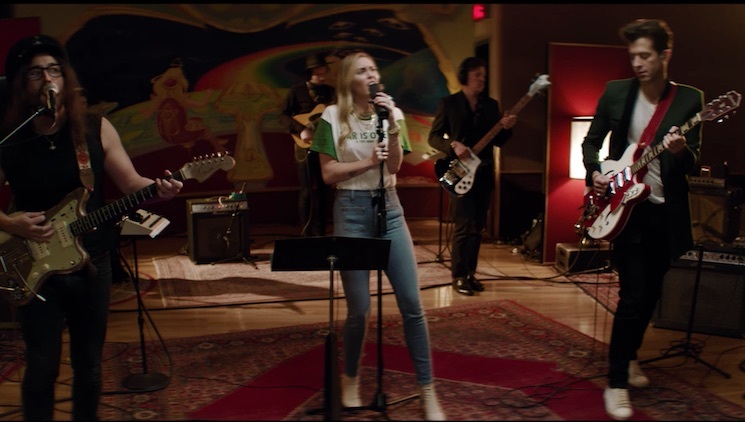 Miley Cyrus, Mark Ronson and Sean Ono Lennon simply can't stop performing their cover of John and Yoko's holiday classic "Happy Xmas (War Is Over)." After releasing a studio version of the cover, they played it on SNL. Now, they're revisiting it once more with another live performance. The trio and their backing band swung by Electric Lady Sound Studios in Greenwich Village to blast through the hit tune. The video, available below, is fairly similar to the SNL set. Lennon even wore his leather daddy outfit again. In addition to the cover, Miley Cyrus has released a limited edition "War Is Over" R-shirt. The shirts, which will raise funds for Yoko Ono's Spirit Foundations charity, are available here. But will they arrive in time for Christmas? Watch the new performance video below.